Of all the feats Bryce Harper has pulled off in his six-year MLB career, perhaps none has been quite as remarkable, impressive and downright preposterous than what he accomplished during Monday night during the Nationals-Mets game. 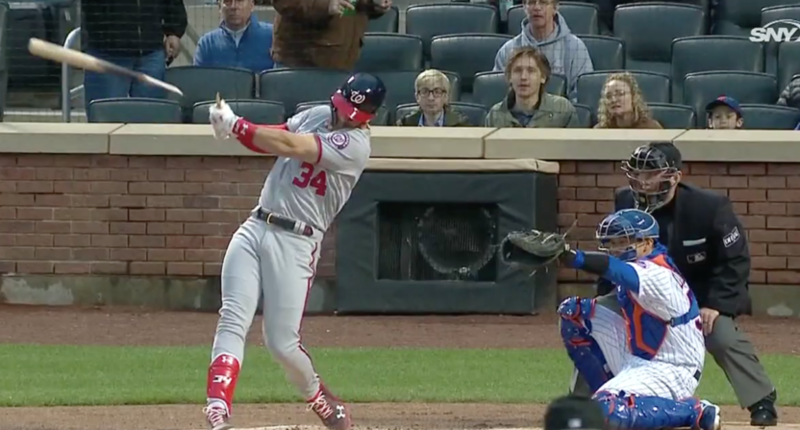 Facing Jacob deGrom with two outs in the first inning, Bryce swung hard on an inside baseball, shattering his bat and leaving himself with only a handle in his hands. But whereas the vast majority of broken-bat hacks result in looping line drives or weak ground balls, Harper’s generated enough power that the ball carried to right-centerfield, then kept carrying right over the fence for an absurd solo home run. Now, broken-bat home runs are not entirely unheard of. But typically, the bat simply cracks or splinters instead of breaking at the handle as Harper’s did. And in most cases, the ball ekes over the fence in a short part of the ballpark instead of soaring 406 feet to right-center. Harper seemed to realize he had done something ridiculous because he carried the bat handle with him all the way to first base, as if to make sure every understood what had just happened. Harper is off to yet another impressive start, this time in his contract year. After his first-inning home run Monday, the 2015 MVP is hitting .314/.486/.804, while leading the league in OPS (1.290), home runs (eight), walks (20), runs scored (16) and the all-important category of broken-bat dingers.